Following the outbreak of the Franco-Prussian War in July 1870, in September Monet fled with his family to London, his Republican politics giving him little cause to fight for the survival of the Empire. He stayed in London until May 1871, when he moved on to the Netherlands before returning to France in the autumn. This first trip to the capital was neither particularly happy nor productive, and Monet painted only a few canvases: of the Thames, Green Park and Hyde Park. 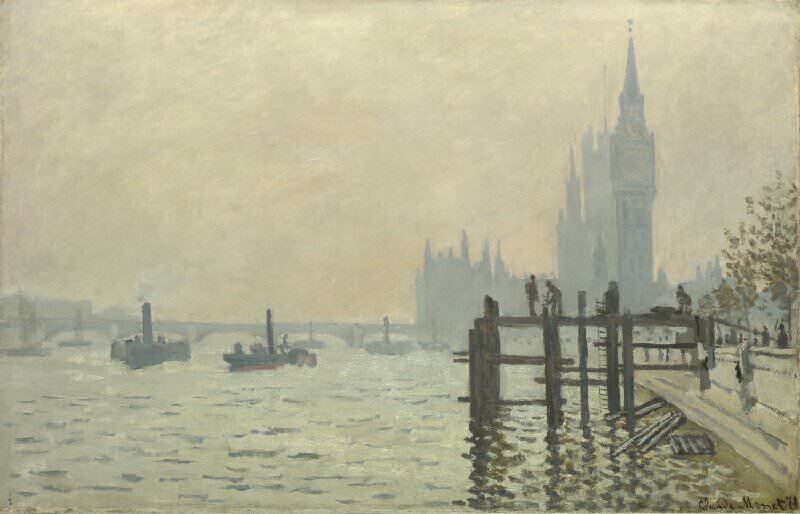 This is the best of the works, showing the Houses of Parliament shrouded in fog. He later came to like the city, returning on several occasions, and once told the dealer Rene Gimpel: "I only love London in winter... without its fog London would not be a beautiful city. It is fog that gives it its wonderful breadth. Its massive, regular blocks become grandiose in this mysterious cloak'. The constant, diffuse lighting unites the painting and softens the contours, while giving a blue tinge to the Parliament buildings. The subtle variations of color and gradations of tone in the sky merge almost seamlessly with those of the water, the two separated only by the bridge. Apart from the green of the trees and their reflections and the streak of red on a boat hull, the colour scheme is dominated by blues, violets and purples. The work was exhibited in 1873 in London by the dealer Paul DurandRuel, whom Monet first met on this trip. Durand-Ruel, who had earlier bought works of the Barbizon School, was to be an important contact for Monet, giving him a sorely needed degree of financial security. Another refugee at this time was Pissarro, with whom Monet visited the galleries of London, in particular seeing landscapes by Constable and Turner. Both Englishmen were important precursors of Impressionism in so far as they attempted to capture changing effects of light and climate and to work in the open air. Monet was, however, generally dismissive of any perceived similarity between his own work and that of Turner.